Over the years, I have received a e-mails concerning some of the people in my genealogical database. There is some confusion out there about which last name was used by whom and when they used it. There are plenty of Saurettes out there, but also a lot of Larose/La Rose people as well. Jacques Soret came to New France in the mid-18th century in the service of the army. It is while he was serving in that capacity that he was given the name Larose. Thus we now have Jacques Soret dit Larose. Sadly, I do not have any primary documents yet to offer up, but I have a lot of other evidence showing a widespread usage of the Saurette surname. If you’d like to read a good summary of what dit names are and how they might affect future generations, read this article. One sentence from this article really pertains to our situation. It says, “Very often the dit name was passed down to later generations, either in place of the original surname, or in addition to it.” This it what appears to have happened to a few branches in the Saurette dit Larose line. The main reason I did not give this issue much thought in the past is mainly because all my direct ancestors used Saurette as their surname. My great-grandmother, Marie-Anna, was the last of my Saurette lineage. You can see Saurette as her name on her marriage certificate. This census image from 1901 shows Marie-Anna’s family – listed as Saurette. Of interest is Guillaume Saurette, father of Almeric, who was Marie-Anna’s father. This is another reason why I use the Saurette surname – I have no reason otherwise. Guillaume’s father, also named Guillaume was born in 1806 and also went with the Saurette surname. Here is the image showing the 1881 Census Information. So that just leaves Joseph, Jean-Baptiste and Jacques. I do own parish CDs for marriages for a lot of locations. Check out this page to see the listings for the last three of my Saurette forbears. I have come to the conclusion that Saurette was the original surname and Larose was taken as a ‘dit’ name by Jacques while serving in the army. At some point down the line, some individuals, for whatever reasons, dropped the Saurette portion and use Larose which evolved into La Rose as well. 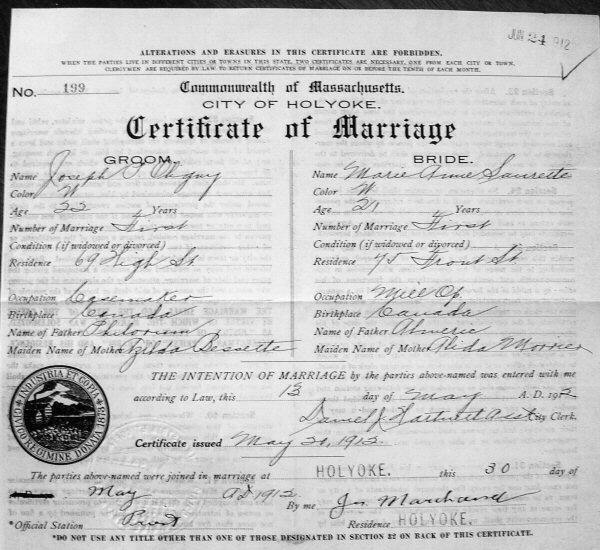 I have also seen the name hyphenated in the marriage records, ie Sauret-Larose. I’m very interested in getting input from people about this name issue. I’d love to see any primary document where the name is clearly not Saurette. I am most curious to find out when the name split into the two.